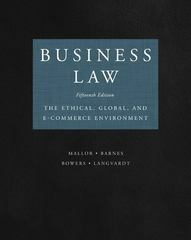 Business Law 15 Edition Mallor, Barnes, Bowers and Langvardt’s: Business Law, 15e is appropriate for the two-term business law course. The cases in the 15th edition are excerpted and edited by the authors. The syntax is not altered, therefore retains the language of the courts. As in recent previous editions, the 15th edition includes a mix of actual AND hypothetical cases. This text is our most research-based Business Law text.